The framework uses the approach described below in the original posting but has many features, optimizations, and defect fixes wrapped up for you and ready to use. The post contains an updated version of code from a previous blog post here at Teton Technical. It includes changes that will soon be in the next version of the QuickConnectiPhone framework. In order to use this methodology a button with an onclick listener has been defined in the index.html file as seen here. It tells the UIWebView to load a new page called ‘call’ and passes two parameters, a command and a parameter that can be used by the objective-c. In this case it is actually not used but is here to show you how parameters are passed. Here is the code fragment that contains the objective-c method that is triggered when a location change is requested,the full code for the class containing this method is at the end of this posting. It checks to see if ‘index.html’ is being called. If it is then it returns YES so that the load will continue. Any other request for a page changes is stopped by returning NO. It also parses the URL that is the request and retrieves the cmd and any other parameters sent in the URL. If you were using the QuickConnectOC, Objective-C, library in on the objective-c side of your application you could simply pass the command and parameter array to it and let it handle it for you. If you are not using the QuickConnectOC library you will need to handle it yourself with conditional statements. Since I have not yet posted the QCOC library, it should be available this week, I have shown how to embed the conditionals statements for doing logging of messages and calling core location functionallity. * you can make the call that is commented out below. I hope this helps you all out. Here is the full code for the updated UIWebView example. This file is part of QuickConnectiPhoneHybrid. along with QuickConnectAJAX. If not, see . //an object to hold acceleration values in all three dimensions. //this function will scroll the current view by the x and y amount. This function is ususally called by the Objective-C portion of an application. * of these items as strings. Sounds like Phonegap does some of the things that QuickConnectiPhone does. Have you considered using it as the implementation platform for Phonegap since it is already written and has some hardening behind it? You may want to rethink how that works. I am putting QuickConnectOC up on the sourceForge site. You may want to look at that as a solution for handling the requests for behavior on the OC side. Great stuff – I implemented a Google map interface with this using the rotation, location, and other ObjC variables. Took a bit to wrap my mind around, but I love the simplicity and ingenuity of your approach. 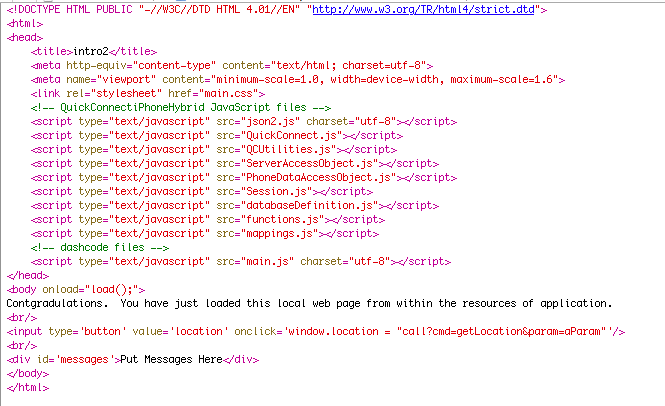 Even better is using the call?cmd structure to send commands out from the browser to ObjC. Not the ideal method, but it worked enough for my uses. QuickConnectiPhone 1.0 is now available. It is a framework that uses the technique described above and has many other capabilities. Look at this https://tetontech.wordpress.com/2008/10/30/quickconnectiphone-10-available/ posting to see more. You can access both the SQLite db in the UIWebView as well as any SQLite db you ship with your application. There is a file in version 1.1.1 of QuickConnect called DataAccessObjects.js That is a wrapper designed to help with this. You must understand that all calls to the databases on iPhones are asynchronous. If you roll your own access and try to do it like you would on a backend (synchronously) you will be very frustrated. Is it possible to make an Objective-C call directly to the database used by the UIWebView? Maybe. It would have to be discovered where this file is and what it’s name is. Depending on what you are trying to do, it may be easier just to use the wrapper provided by QuickConnectiPhone and put the data directly into the native db. It isn’t any harder than putting it in the UIWebView db. Thanks for your response , great info. Can I use this library for a commercial use? You bet. I chose the LGPL license for this very reason. On iphone if I load a local html file, I can not store any cookies. It works fine in safari on mac. However it fails on the iphone. Cookies are only sent back to the origination location of the original page loaded. If the original page is located on the device then cookies are not sent back to some other server when an AJAX call is made. I started working on this problem on Thursday of last week but as of yet have not been able to come up with a solution that keeps the initial page locally on the machine. I will keep looking at a solution for this. The QC framework linearizes these calls for you if you use the mapCommandToBCF, mapCommandToVCF, and the other mapCommandTo* functions. In other words you don’t need to worry about making sure that one call to the underlying Objective-C completes before another is made. The framework will take care of it for you. Thanks Sandra. Glad to be of help. Omitting this function, takes to a request passed to the shouldStartLoadWithRequest which is equal to my page absolute path without any parameter or “call?” string. What does load() function do? Could you explain me how all this works? I’m not sure from your explanation what the issue is. The load() function is the body onload event listener. 2. In this method you have access to the entire URL associated with the link or the requested change. 3. You can then parse the URL to determine what you want to do. 4. the shouldStartLoadWithRequest always returns NO so that you don’t actually go to some other page. Neither will the UIWebView update when NO is returned. 5. Based on your parsing of the URL you can now execute some Objective-C code. Any application for any platform/language can be taken apart. Even those written in Objective-C can be decompiled and the source viewed. The xib files are just XML and can be viewed as well. I recently came across obfuscation tools.Its nothing but removing the space.Simply,hard to read format. Objective-c can be decompiled?oh,I didnt know it.I will check it. I tried to open compiled .NIB files.But I couldn’t.If you can ,kindly let me know the way to read compiled .NIB file. I went through your post and must say its good. I have made a UIWebview for login on my website. I have retrieved and stored the associated cookies, and now as soon as I log in I want my application to get back to the view of my iphone and display the mobile app. like there should be a direct call from uiwebview to the home page(made in xcode, only if the user is authneticated). Is it possible to do the same somehow using cookies or is there any other simpler mechanism to go from uiwebview back to the files on your iphone that you have made using xcode. I’m not sure what you meant by “go from uiwebview back to the files on your iphone that you have made using xcode”. Now, as soon as they are authenticated in my uiwebview(website), i want my application to get out of uiwebview and display the transactions.xib interface i made in xcode, aka, i just am using uiwebview for authentication of user name and password, rest of the functions are purely objective c based and dont need uiwebview. It is possible to load the xib file you have available and begin processing. It may be much easier to use the NSURLConnection class to begin with rather than the UIWebView. That way you would stay in Objective-C for the entire span of your application. There are many examples on the web of using NSURLConnection. If you need one I can provide one. An NSURLConnection object provides support to perform the loading of a URL request. I have the webview working, so I do not need to refer any url, I just want to load the xib file without referring to url, nsurlconnection has nothing to do with this. I will need something like NSUserDefaults , if you have any clue about nsuserdefaults with respect to uiwebview to retrieve usernames, let me know, along with that, getting back to the previous topic, also if you have any clue about retriving a native objective c xib/or implementation file upon authentiacation of the webview content, let me know.